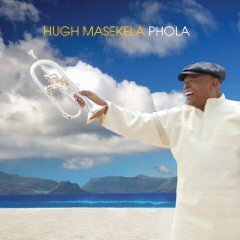 Jason Crane interviews trumpeter Hugh Masekela about his 2009 album Phola (Times Square Records). The album finds Masekela in a quieter, more reflective mood — a decision he credits to producer Erik Paliani. Despite the more reserved surroundings, Masekela’s flugelhorn playing is as intense as ever. In the interview, Masekela discusses Miriam Makeba, music as a political force, and why he doesn’t play for fun. Finally able to listen to Masekela. Soooo beautiful! Vocals equally delicious. Thank you Jason. Awesome representation of the making of Phola! Bro Hugh ad Erik had something special,its clear when you check out the footage of their concerts!